Due to the physical appearance of the Ethiopian Wolf it is often mistaken for either a fox or a jackal. They are a medium sized wolf with very long legs and a muzzle that is more pointed and elongated than other species. They can have a variety of colors including reds, browns, and some white. The color often gets darker with age. This particular species of wolf is only found around the areas of Africa, namely Ethiopia which is where their namesake comes from. Sadly, there are only about seven locations in the area that are believed to still be home to them. Most of them reside in the mountain terrain but they have also been identified on the plains. They also feature ears that are very pointed. They also have a tail that is shorter and thicker at the end than other types of wolves. The aggressive nature of these wolves is less than of others. While they are still territorial it isn’t to the extreme of other types when it comes to getting along with other wolf packs. The fact that there are fewer of them and the packs are more spread out could have a great deal to do with that fact. However, they are more dependent socially upon their pack than other types of wolves. They seem to thrive on the social interactions that take place within a pack. They have groups that usually have about six adults and then a group of pups which varies with every litter. Rodents make up the largest part of the diet for the Ethiopian Wolf. While they do live in packs, they don’t hunt together. Therefore they stick to animals they should be able to capture on their own. The rivalry among the packs can increase when it is time to mate. It is estimated that more than half of all successful conceptions are from a male outside of the pack. This is very different than in other species of wolves. The females will give birth to a litter of up to six young at a time. What is unique is that the males born into a pack of Ethiopian Wolves will remain with it for the rest of its life. It is the females that leave when they are about two years old so that they can find another to mate in. They are generally accepted into another pack for breeding purposes. This is one of the few species of wolves where other pairs besides the alpha and the beta are allowed to mate. 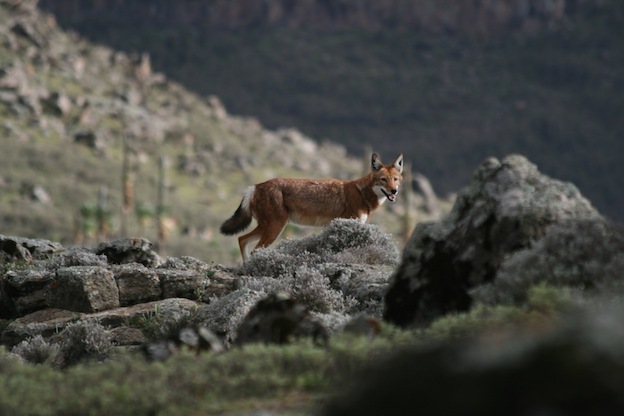 The Ethiopian Wolf is in dire need of protection with about 550 adult wolves remaining. However, it is very hard to accurately count them due to their movements so this is an educated guess based upon careful research. While they are protected by law, it is very hard to enforce those laws in Ethiopia. Due to the number of individuals there that now possess guns, the killing of Ethiopian Wolves for food is easier than before. Some villagers take part in it because they have no other way to feed their families. In 1990 there was a serious outbreak of rabies among the Ethiopian Wolves along Bale Mountain National Park. This scared many people and it is believed that over 400 wolves died from it or were killed due to being positive for it. The efforts of the Born Free Foundation stepped in to help by offering free rabies vaccinations for others so that the problem wouldn’t continue. This helped to reduce the number of cases reported since then drastically.